Multi-Parameter functionality: Mass Flow, Volumetric Flow, Gas Pressure and Temperature. Multi-Gas functionality: support for 90 different gases and gas mixes. “User Defined Mixture” functionality allows to create and store up 20 custom gas mixes with up to 5 different gases each. Quick (< 20ms) response time. Standard accuracy ± (0.5% RD + 0.2% FS). 200 to 1 turndown ratio. Two programmable mass flow rate totalizers. High, Low or In Range Alarms with preset action delay for Mass Flow, Temperature and Pressure. User programmable mass flow rate Pulse Output (via SSR). Extensive Self Diagnostics with status LED or OLED indication. All 3 user selectable analog output interfaces are standard: 0-5Vdc, 0-10Vdc, 4-20mA. Two user selectable digital communication interfaces (RS-232 and RS-485) are standard. Optional Modbus RTU network interface with isolated RS485 transceiver. User programmable solid state relay with latch option. Universal 9-26 Vdc power supply input. Local high contrast OLED (optional) graphic display with joystick control. Free, easy-to-use configuration and calibration software (RS-232/RS-485). DPM series digital multi-parameter mass flow meters provide accurate measurements of mass and volumetric flow rates, pressures and temperatures of process gases. 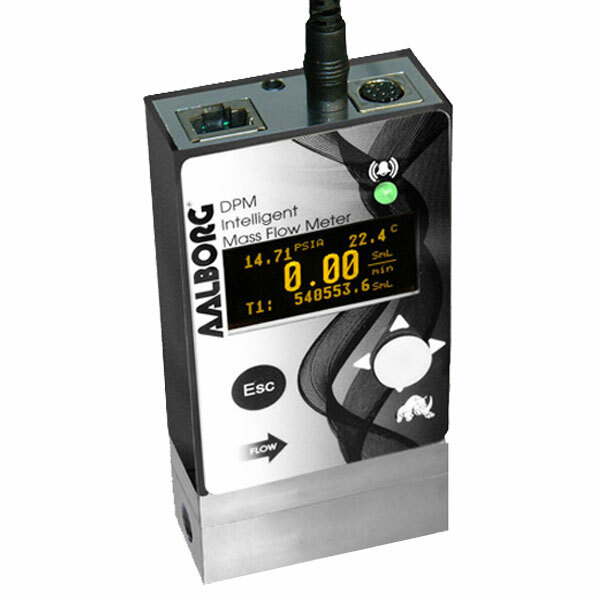 DPM mass flow meters incorporate multi-parameter multi-gas functionality which allows users on site to select up to 30 different gases locally via optional OLED/Joystick interface, or remotely via the RS232/RS485 interface, or optional Modbus RTU interface. 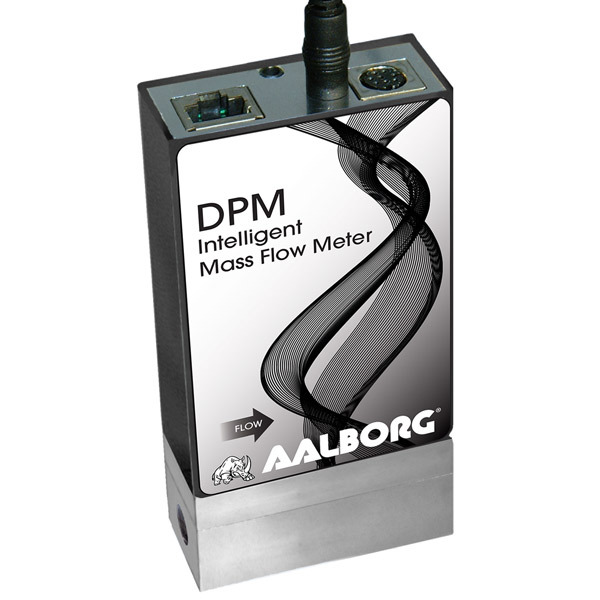 DPM flow meters support two programmable flow totalizers, low, high or range flow, temperature and pressure alarms, automatic zero adjustment (activated via local or communication interface), programmable SSR relay, programmable 0-5 Vdc, 0-10 Vdc or 4-20 mA analog outputs, user-programmable pulse output (via SSR), and extensive self-diagnostics. DPM mass flow meters feature multi-parameter/multi-gas functionality, ± (0.5% RD + 0.2%FS) standard accuracy, 200:1 turndown ratio and 10-20 ms response time. Used in a variety of industries: scientific and analytical applications, bioreactors and surface depositions, gas sampling, manufacturing and metrology activities. Significant savings are apparent, comparing the cost of a single DPM meter embodying these features, with that of acquiring and installing multiple, application-specific devices.